I like Sonic’s design. He looks like a wanderer or something. It’s pretty cool aside from blue arms. Ah thank god! It could’ve been terrible. Let the farce begin. I can only laugh at the background. FIRST, THEY TOOK OUR BLACK EYES. NOW, THEY TOOK OUR BARE ARMS. BLUE ARMS THE FRANCHISE IS OVER MILLIONS ARE DEAD. Aaaanyways, joking aside, the redesigns are actually… well, pretty cool, I find. Sonic in particular — not so neat and proper, I dig that. Fitting! Knuckles… It’s nice and all, but the head… Ah well, it’ll likely look better once we see him moving. Can’t judge much based off of a still, but still. Eager to see Amy and Tails’ designs. Sonics eyes were changed for a few reasons, when he was stuck inside chaos and absorbed to much chaos energy it turned his eyes green. I have a really old comic where sonic beats anti-sonic and absorbs him, giving him his “cool” traits and green eyes. The ’06 reboot didn’t make character look THAT different. But this? This is just horrible. It’s NOT a reboot! 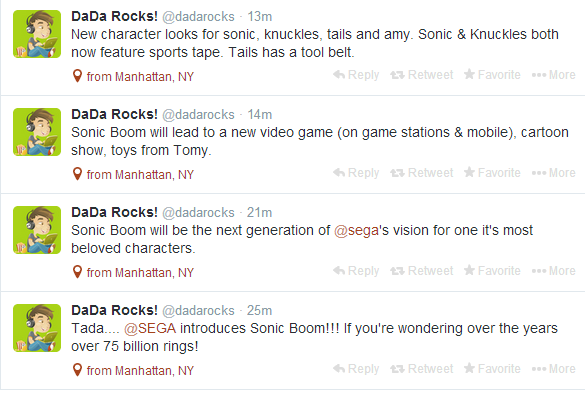 SEGA never said anything about a reboot, it’s all just rumors. Just because they said that they are making ONE game, and never specified if it’s based off the show or if the show will lead the direction of the franchise, it does not mean that the games’ continuity is being changed from beginning to end. They have not revealed enough details yet, we just have to wait and see what they have planned. I do like Knuckles design. He should be the leader of the group! No. He’s not a leader type at all. Sonic looks neat, Knuckles is well… uh… different. 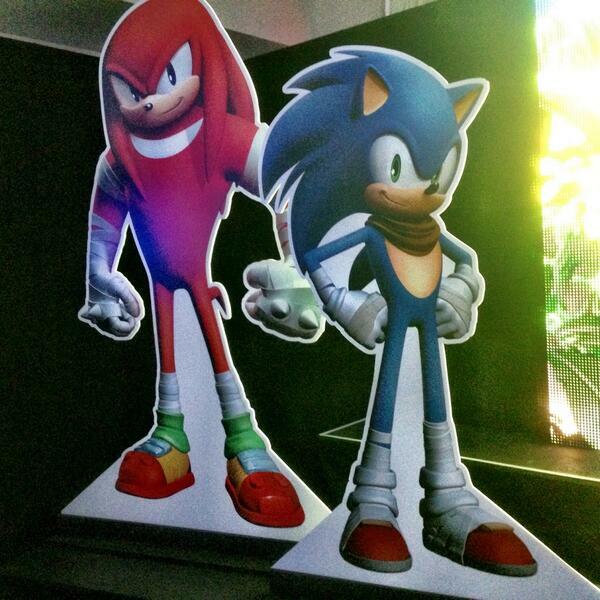 Knuckles looks terrible… epcecially with thay head on that body! ….That being said, I don’t know if it’s the quality of the image itself or the fact that it’s just a still, but I feel like the execution of these designs could have been handled better… They’re not “bad”, per say; I’m completely fine with how Sonic’s design is handled, but Knuckles….could have been SO much better. Ah well, I guess I’ll get used to it. I wonder what Amy and Tails will look like? They’re not bad. But I don’t think they should throw away the simplicity of the character designs. I notice they’ve got rid of Sonic’ iconic shoes. That’s like redesigning Mario’s hat. Does Sonic look like Proto Man to anyone else? Um… Okay, blue arms I THINK I can deal with, but what the hell have they done to Sonic’s shoes? I’m really hoping that these designs are purely for the BOOM series and not the actual continuity. It looks like fan art, I just can’t see myself enjoying Sonic like this. I could enjoy the Boom series of games/shows if these designs stay within those mediums and don’t leak over to the main series, but knowing SEGA and their tendency to screw up these kinds of decisions, I’m guessing this is here to stay. Other than the blue arms, I actually don’t mind this. It’ll take adjusting, and they’re still works in progress and might not even be the end result, but you know what? It’s not so bad. And I’m really proud of how the fans are handling this. …Watch how after I say this someone makes a giant spiraling rant. Wow…that actually looks pretty natural. I mean, their heads are literally the same render as they normally are. And their designs match them perfectly, even in CG. The only thing that bugs me is the blue arms. BY GOD, I hope that’s not the final design, because it just cheeses me off so much! I know there are some fans who whine about what color Sonic’s eyes are, but for me, Sonic’s arms are supposed to be furless. It’s just a fact. You can change his eye color, you can change his shoes, you can change his body shape and design, but there are certain guidelines you have to follow when making this character. His shoes must stay red and white with at least some form of yellow or buckle on them (check), he must have the correct number and shape of spikes (check), he must be lanky in some form, be it round belly or slim (check), he must have white gloves and socks (check), his chest must be plain (check), and finally his arms must be the same color as his skin, NOT his fur (NO CHECK!!). I’m sorry, I know it’s stupid and nit-picky to get so upset over a detail as small as that, but that just pisses me off! But who knows? It hasn’t premiered yet, and it could be revised, given time. I mean, there were actually fans that complained about Bugs Bunny being a grey-ish purple rather than grey on the Loony Tunes Show, and they revised his color by the second season. Maybe if the fan base complains enough (which I’m sure I don’t even have to ask for) they might change it, but if not, I won’t let it ruin the show for me. Hopefully the show will be so good that I don’t even notice it after a while. If it IS corrected though, then that’s an added bonus! People look at this as a joke, but I see it as my whole view of Sonic is changing. I’m upset about the disings and who knows what else they have change. I just hope that this docent change everything in the Sonic I know and the great comic’s, adventure and games they have been a part of my life for so long. For now I’m very disappointed. Um, blue arms? And what’s the deal with the tape? I just hope this is not for the actual continuity of the whole Sonic universe. I’m now really paranoid with all this. oh jeez…BLUE ARMS WHY…He looks kind of stiff but meh it’ll probably be better in the game. I have no words for Knuckles. just….none. To be completely honest, the new designs are just awful. Thank God they didn’t put Sonic’s disgraceful new appearance onto Super Smash Bros. Though the game looks pretty fine from it’s trailer. Sonic seriously looks like a country stereotype. And another thing- is this going to completely change Sonic’s appearance for the next 12 years? I didn’t like the design. People complained about the designs of all the characters (except Eggman) as if it’s not them anymore. They loved the older Sonic because it was him in the first place. The fans, the judges, they all didn’t like it that much. It didn’t suit them they said. Amy looks like she’s all but I know she’s always ready to fight. Tails looks like he grew up from being ” Old Tails ” to ” New Tails ” it was good though. Sonic. Now Sonic is what I’m focusing. They expected him to be more him and not a wanderer from the desert. Where did the Green Hills Sonic go? I liked his fur in his spikes but the bandages in his legs made him look taller. Those blue arms are not fitting. They were peach in the first place. Now Knuckles’ face is like it’s been pasted in his new body. Knuckles was better before. Every fan loved him because it was good. The reason why SEGA is losing his fans because of the designs. It was no longer them. Now people are saying goodbye old Sonic gang because they miss them. That’s my saying. Did any of you know that Sonic has had blue arms since the beginning? Archie Comics made him have blue arms alot in the early days, and every once and a while I still catch it!Also, there are several hacks where he has blue arms and once during Sonic Generations, I was playing Modern Sonic, and as he rounded a corner in GReen Hill Zone, his left arm turned blue!As for Knuckles, he has always been buff in the early comics too, with beefy, huge arms sometimes! Maybe they were ”Foreshadowing” the future? Yes but Sonic was not made by Archie Comics at all. Yuji Naka was the one who made Sonic. He was his creator so I should recommend you to just go with Yuji’s ideas instead of going with the flow of Archie’s.